Amy-Lea Wright explores how England’s 'second city' came together through art, after the tragic events of 22nd May 2017. Now, almost a year later, I still proudly push my sleeve up to reveal my stripy little six-legged companion at any given opportunity. So much so, that, “wait ‘til she gets her bee out,” is now my boyfriend’s favourite quip when we meet someone new. It seems the humble worker bee is hard to avoid in Manchester. Adopted as a motif during the industrial revolution, it originally represented Mancunians’ hard work in the textile mills which were often described as being ‘hives of activity.’ Now, it has a whole new meaning - as a public symbol of unity after last year’s attack. I refuse to call it a ‘terror’ attack because terror was not created. “I was actually painting loads of bees in a bar called ‘The Brink’ the night it happened,” artist Russ Meehan told me. 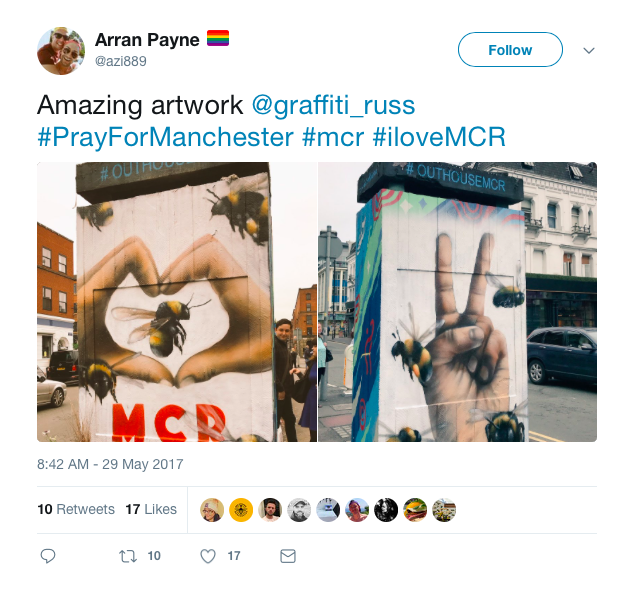 Russ, who creates his artwork under the name Qubek, is the man behind the mural on Oldham Street which depicts 22 bees in tribute to the 22 people who were killed in the attack. “I wanted to do a memorial piece but I knew it’d have to be a really good wall to paint where a lot of people would see it.” Russ continued. “I did have the idea myself but I thought I probably haven’t got the sway to make this happen. That’s why I did those two smaller pieces in Stevenson Square first, with the hands and the love heart, because I just wanted to give something back to everyone that had done so much to help out on the night and the following days after. “It was my way of showing how I felt about the whole thing. I saw everyone doing positive things like giving hugs to strangers in the street. I think, as human beings, we do react quite quickly but without thinking too much about it – that was where I was. I had it in my head that I wanted to do those pieces and I couldn’t get it out of my head. It became a bit of an obsession. “The Manchester Evening News got in touch with me because they wanted to do a big memorial piece too, so I left it with them and they went out and tried to find a suitable wall. They paid for the paint and the cherry picker and everything - they made it happen really. “I didn’t think it would go as viral as it did. I do use social media but I’ve never really been involved - apart from when I painted over David Bowie with Sloth from The Goonies and everyone went crazy. That was the first time I realised how powerful social media can be if you do something that means something to people. “A lot of people have heard about me through this so I wanted to do something positive with it. I’ve raised about £16,000 for charity from those paintings as well as a load of bee canvases which I gave to people to auction off. I’m not planning to do any more memorials because I don’t want it to look like I’m trying to make money or gain any attention from what happened. Chris Greenhalgh is the brains behind the ‘I Love MCR’ logo which, much like the worker bee, has become an emblem of the city’s refusal to bow down to hatred and division in the wake of last year’s attack. “My Mrs and I were taking a break (from each other) and as I was in bed at my parents’ house, I received a panicking text from her asking where I was and if I was safe,” Chris told me. Chris, a graphic designer and now CEO of the thriving I Love MCR organisation, made the logo in reaction to the infamous Manchester and Salford riots back in 2011. An antidote to anti-social behaviour - with an aim to show the world that the people of Manchester are proud of their city. I couldn’t resist asking Chris if he knew what else ‘MCR’ stood for. “Yes, tongue in cheek, My Chemical Romance were mentioned a lot,” he said, “But that abbreviation was definitely an important factor for the symbol. The method of good graphic design is to get the message across in as few words as possible. 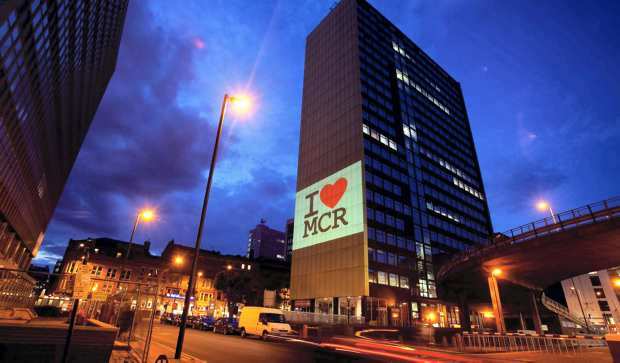 “To see that sign reverberated all over the city after the arena attack was magnificent. All the PR and marketing behind I Love MCR for the past seven years resulted in the logo being used to help the city come back to some sort of normality. “We’ve raised about £100,000 through selling various merchandise which features the logo over the past nine months. Now, we’re launching a membership app to give something back to our followers via our relationships with various vendors all over Manchester. We have invested in new media throughout the city, including outdoor digital screens and radio stations and we aim to be the biggest platform in Manchester with the strongest integrity. I always thought I was biased in believing Manchester is the greatest city in the world. I mean, it’s the place where I found my first love. Where I went to my first rave. Where I christened my first crock-pot. Where I simply learned to live on my own - after eighteen years of being wrapped up in cotton wool in a small town on the north-east coast. Of course, it was always going to be the greatest city in the world. Yet, after seeing the way in which the Manchester community united after the events of 22nd May last year, I know that it really is the greatest city in the world. No doubt about it.